Live in the beautiful San Joaquin Valley. La Querencia is a 28-home community on 2.8 acres in Northeast Fresno, in the heart of California. The community is close to good schools, churches (next door to the Unitarian Universalist Church and the Buddhist Temple), shopping, and bike and walking paths. Fresno offers a cornucopia of cultural activities, including festivals, events, galleries, concerts, opera, and theater, and ample outdoor recreation opportunities. Fresno is within an easy drive of Yosemite, Sequoia, and Kings Canyon National Parks, San Francisco, Los Angeles, the Pacific coast, and the California wine and gold country. Eco-friendly features include: photovoltaic solar panels on every home; passive solar features on the pool; whole-house fans; Energy Star appliances; natural light; dual-flush low-flow toilets; low-VOC and high-recycled content in flooring, paint, and work surfaces; dual-pane windows; advanced framing techniques; cellulose insulation, and more. Additional amenities include: gym, pool, accessibility lift for pool, spa, community-wide WiFi, workshop, organic vegetable garden, common house with gourmet kitchen, water and waterfowl view, guest room, children's playroom, youth room, lounge with fireplace, front porches or balconies and trellises. 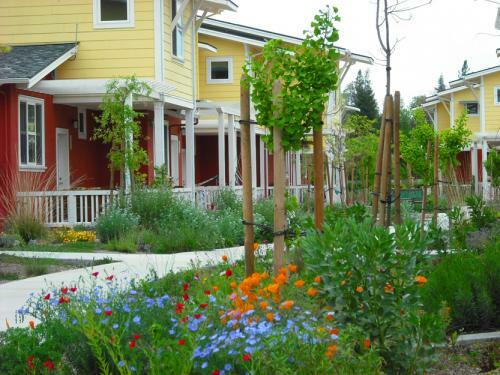 The random day to day activities and events in Fresno Cohousing, La Querencia. A gathering of people living in community, sharing resources and creating a better world, one neighborhood at a time. Residents created a video which gives an overview of life in the community. Please visit our site for photos, architectural drawings, information about Fresno, etc.